Karen Berger helped change the course of comic books. As an editor at DC Comics, she was instrumental in the development of Alan Moore’s Swamp Thing and Neil Gaiman’s The Sandman, two titles that showed off superhero comics’ potential for more sophisticated, provocative storytelling. In 1993, she founded the DC Comics imprint Vertigo Comics, publisher of titles like Fables, The Invisibles, 100 Bullets, and Preacher, and Y: The Last Man, which all did especially well in bookstores and libraries and helped popularize the graphic novel format. Berger’s time in superhero comics gave her an understanding of the medium’s popular appeal, and over the course of her career, she’s successfully brought creators with distinct and experimental artistic sensibilities to a wider audience. The 2012 announcement that Berger was stepping down from her executive editor role at Vertigo was a major blow to DC Comics, the latest in what was a cascade of bad news for the publisher at the time. Berger took a short break and made her way back into comics with the Image Comics series, Surgeon X, but she’s coming back with force next year as she launches her new imprint at Dark Horse Comics: Berger Books. Four new series are debuting along with two updated editions of esteemed Vertigo graphic novels, and The A.V. Club has an exclusive look at the Berger Books preview ashcan currently being distributed at New York Comic-Con. Berger Books kicks off with Hungry Ghosts #1 on January 31. Anthony Bourdain and Joel Rose, the writing team behind Vertigo’s Get Jiro!, reunite for this horror series that puts a fresh spin on food comics with spooky short stories told by international chefs. Get Jiro was an exhilarating action romp driven by a love of food, and this new series allows the creative team to reinterpret that affection in a new genre. These preview pages are by Alberto Ponticelli and colorist José Villarubia, and other artists attached to the project include Vanesa Del Rey, Paul Pope, Mateus Santolouco, and Leonardo Manco. Mat Johnson and Warren Pleece’s Incognegro was one of those Vertigo books that flew under when it debuted in 2008, but it’s become very relevant with current events. The story of a light-skinned black reporter going undercover as a white man in pre-Civil Rights rural Mississippi to save his wrongly accused brother, the original graphic novel is getting an enhanced 10th anniversary edition on February 6, and Zane Pinchback returns on February 7 in Incognegro: Renaissance, a monthly series that has him passing as white again in 1920s Harlem to investigate the death of a black author. Given that Berger was an editor who helped facilitate comics’ “British Invasion” in the 1980s, it’s fitting that she would bring a writer from the UK to American audiences with Berger Books. Emma Beeby is the first woman to write a Judge Dredd comic, and she’s tackling a major female historical figure in the new Mata Hari series, teaming her with artist Ariela Kristantina and colorist Pat Masioni to explore the secret history of the exotic dancer and German spy. Debuting February 21, this historical spy thriller explores how Mata Hari challenged expectations for women at the turn of the century, positioning her as a seductive action heroine. 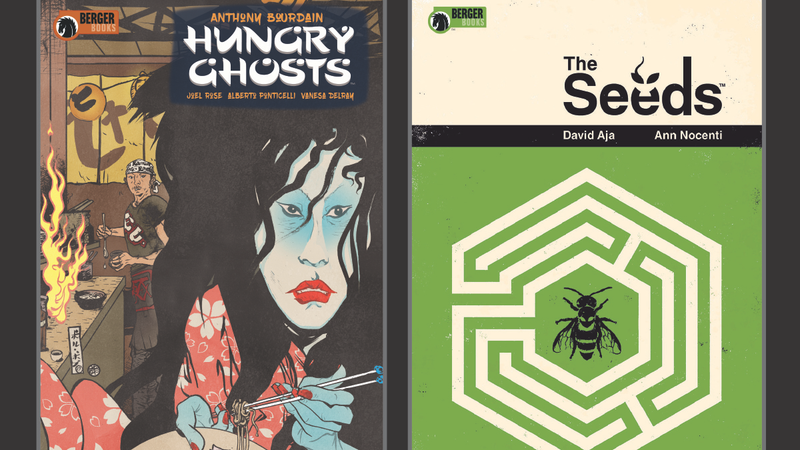 The last Berger Books monthly series to debut is The Seeds, an “eco-thriller love story” that marks the return of David Aja to interiors for the first time since his groundbreaking run on Hawkeye. Writer Ann Nocenti is also returning to creator-owned comics after some recent lackluster forays into superhero comics, and while not much has been revealed about the story, having a visionary like Aja on board bodes very well for this off-kilter sci-fi tale. A new edition of Dave Gibbons’ The Originals concludes the inaugural wave of Berger Books, and in addition to an oversized format, the book also has 32 pages of previously unpublished material. Gibbons’ is a master of the medium, and the production of the original Vertigo graphic novel minimized his talent whereas this blows it up to bigger dimensions, pulling readers deeper into the violent future city he imagines on the page. Is Hawkeye’s Pizza Dog issue the future of superhero comics?